Task was removing existing dispenser islands (concrete and forms). Dispensers had been removed and product lines capped at the shear valves with the STPs locked/tagged out. The STP streetbox lids had been removed but STP sump lids remained in place. A gas powered saw had been used for initial cutting of the concrete islands, which was followed by breaking up the same concrete islands with a bobcat equipped with a breaker. Work had been proceeding normally until a flash was witnessed by the fire watch associated with the concrete demolition crew. The fire watch used a fire extinguisher to extinguish the flash and filled the dispenser sump (13-14) where the flash occurred. 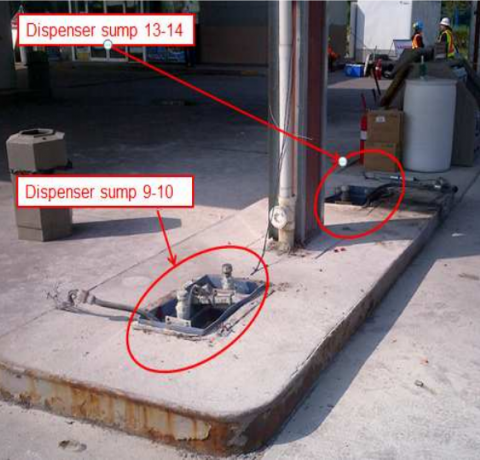 An adjacent dispenser sump (9-10) was also filled with discharge from the fire extinguisher as a precaution. Pressure surge along secondary product line was sufficient to blow off STP sump lids at tank nest. Area was immediately evacuated to muster point where it was reported that there were no injuries as a result of the flash. Further investigation also revealed no property damage occurred. • The potential hazard of working in a flammable environment was not considered/identified. • The hazard of ‘sparks’ was not initially identified as a hazard on the JSA when prepared by the subcontractor. 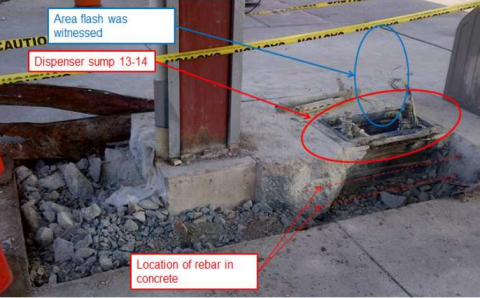 The site superintendent added this information as a hazard during his review of the JSA. The control/mitigation put in place was to have a fire extinguisher on hand when breaking out the island forms. 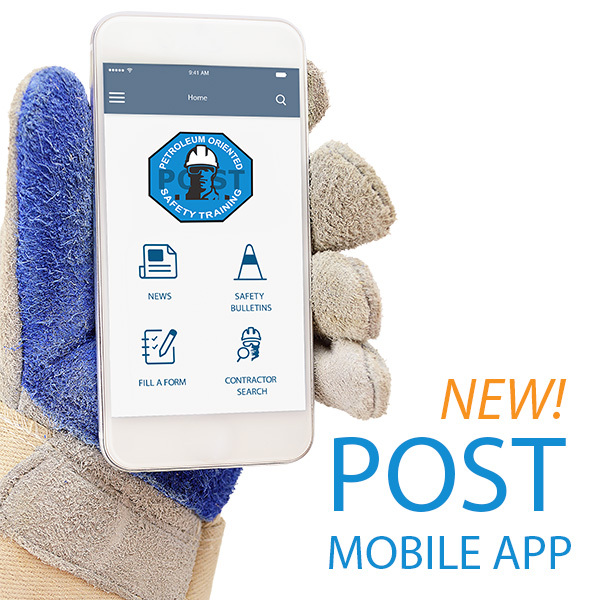 • Failure to effectively use our Safety tools puts us and those around us at risk.